My mom emailed me these photos of Brandy on Thursday. 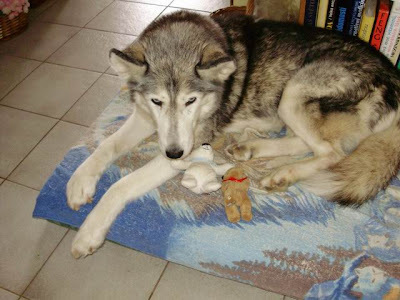 I asked her kindly, if she (mom, that is) didn´t think it was too much, to stuf toys under the resting dogs mouths, and if she missed having children around. 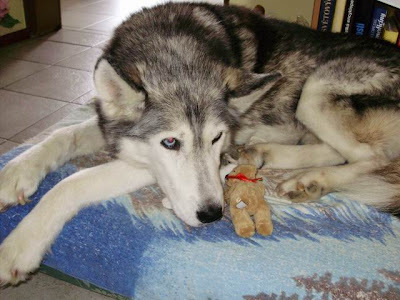 She replied that Brandy stole those plush animals and brought them to her doggy bed! Brandy is 14 and 3/4 years young and as some of you know, she is Kipp d´Amundsen Kennels´ main lead dog in retirement, and lives with my mom and dad in Cernosice, Czech Republic since October 2008.